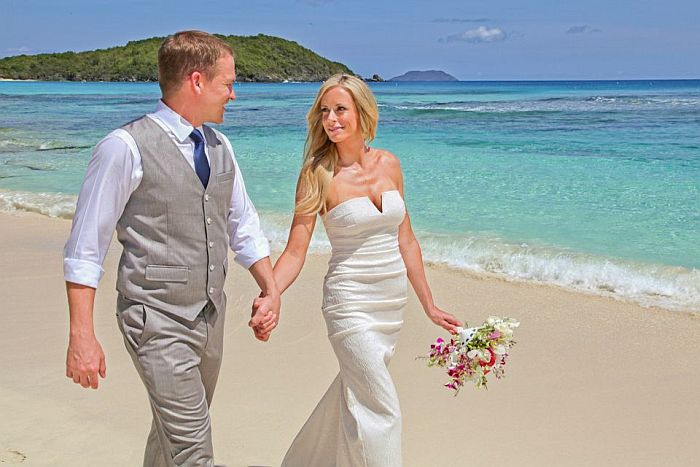 Your wedding day can be spent snorkeling our colorful reefs or sailing our crystal clear Virgin Island seas. 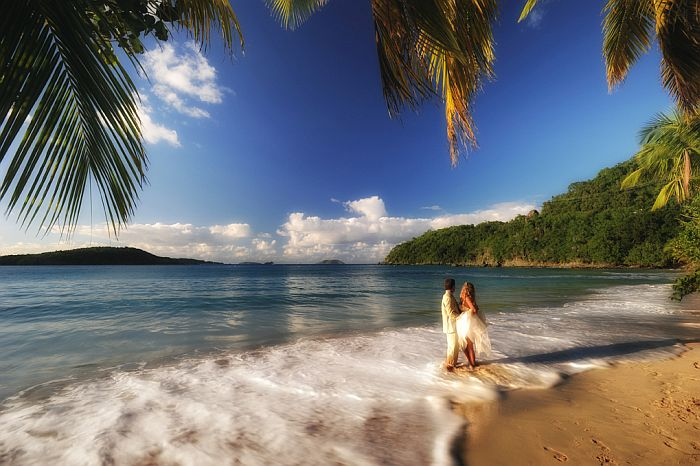 Eloping to St. Thomas or St. John in the Caribbean is the ideal way to avoid the stress and expense of a big stateside wedding that may leave you exhausted before your wedding day. You will save money and time when you elope to the Caribbean and your family and friends can celebrate with you upon your return home. Here’s how it works – apply for your marriage license before you fly down to the US Virgin Islands. Pick up your marriage license in St. Thomas. The marriage license office is on the same highway as the airport. Take the ferry to St John from Charlotte Amalie or from Red Hook. During your honeymoon vacation, Anne Marie will meet you at the beach, marry you, file your marriage license with the court and mail you two certified copies of the certificate of marriage. This way your wedding can be about the two of you make your commitment to each other in a relaxed focused way rather than trying to meet everyone else’s expectations. Furthermore, you can Leave your family history and politics behind and have a meaningful marriage ceremony on the beach with Anne Marie. You can float softly from your beach wedding to your romantic honeymoon. Anne Marie Porter, a thirty-three year resident of St. John, will create an island wedding with you. As St. John’s most popular wedding consultant, Anne Marie has coordinated weddings for people from all over the world. She offers a choice of marriage vows so your wedding service is appropriate for you. Anne Marie has worked with thousands of couples and you may read about their experiences at “What People Are Saying“. “We, Raymond and Marloes Rodnite, want to thank you for the most romantic, wonderful and magical day in our life! Having our wedding on St.John was just the best decision we have ever made.It didn’t take that much preparation for us, and you took care of all the paperwork, which gave us the chance to relax and enjoy the rest of our beautiful day! We loved the way you were so sweet and helpful to us all the time since Ray lives in N.Y. and I live in Holland, it made it a lot easier having everything done over the internet. Really, the ceremony you gave us was simply magical and so overwhelmingly beautiful, it was something we will never forget. “Thank you for the beautiful ceremony on June 6 on Jumbie Bay. Greg and I have been forever changed by that magical day. We were so happy everything turned out so beautiful, the water and wind seemed to embrace the three of us and I felt truly blessed. Your words and those vows were so moving I feel the need to read them every day. Thank you again. Most of all You Choose The Time! From golden mornings to sweet sunsets, to glorious full moons. and You Choose The Place! historic sugar mill ruins, or quaint island churches. Our island ceremony locations are exquisite. The weather is always wonderful, even if it rains, it’s brief and frequently followed by a rainbow. Rather than a stressful, stateside production, your St. John wedding can be just for the two of you, with pelicans, turtles and maybe even a donkey. 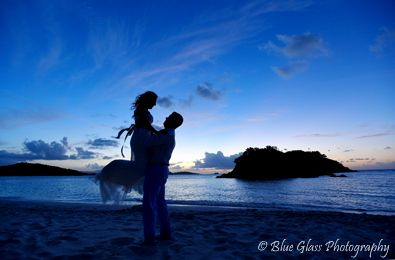 Unlike other islands, St. John is 2/3 National Park, where unspoiled nature is your wedding chapel. 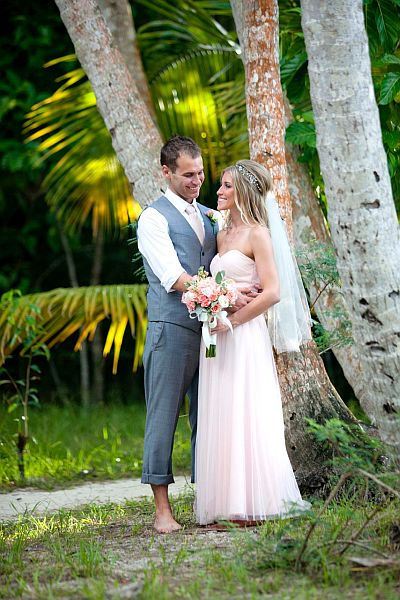 Eloping to the islands for a Caribbean beach wedding is one of the best decisions you can make. Just ask your friends who have had a big stateside wedding production if it was fun and meaningful. Beach weddings in the Caribbean are the stress-free way to go. “Kurt and I are back home from our wonderful elopement and trip of a lifetime! We had a great time and our wedding ceremony was absolutely perfect. Thank you so much for being a part of our day and for doing the ceremony. We are thrilled with our decision to elope and loved having you as our officiant! Again, thank you so much! The fee of $400 includes everything you need to be married in a meaningful way, in a beautiful place, and two certified copies of your Certificate of Marriage.